Entrepreneurship 2020: Time for a new settlement? In the midst of the Eurozone crisis, the European Commission unveiled ‘Entrepreneurship 2020’, a new set of guiding principles designed to re-energise entrepreneurialism across the continent. However, as Joseph Ganderson, Tommaso Giulla and Kayrin Gauci argue, while this action plan had noble intentions, it has struggled to deliver meaningful change in each of its target areas. The time is ripe for a more fundamental reappraisal. The European Union has long compared unfavourably with other advanced industrial economies when it comes to core measures of entrepreneurship and innovation. As far back as 2003, the European Commission published a green paper puzzling over comparatively sluggish rates of business creation and growth, and these challenges have proven pervasive. 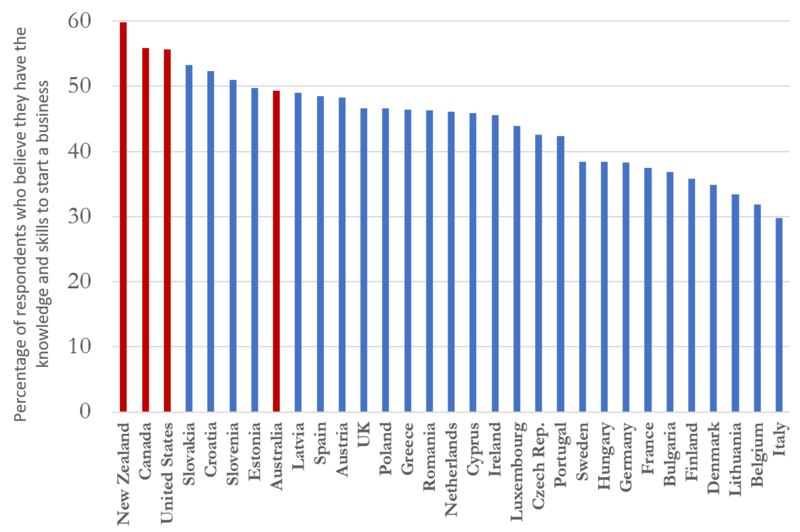 Through 2017, for example, a higher share of American, Canadian and Australian working-age adults were engaged in early stage entrepreneurial activity than in every EU member state, except Estonia and Latvia. These outlying Baltic states also hint at another challenge: internal diversity. Across a range of key variables – education, access to finance, regulatory frameworks, legal and business cultures – the EU28 are characterised by significant cleavages. European policymakers cannot simply square these differences by taking their cues from the social sciences either, as the labyrinthine literature on entrepreneurship delivers no magic bullets. Constantly evolving debates in economics, management, sociology and related disciplines emphasise different understandings of the concept, different sets of analytic phenomena (cognitive, institutional and social factors), and a diverse set of best practices for public policy. Having said that, while there is no essential roadmap, scholars remain in broad agreement about the destination: entrepreneurialism is good for the economy and society. Armed with this knowledge and prompted by the biggest economic crisis in a generation, the EU Commission has stepped up its efforts in this area in recent years. A public consultation with stakeholders across Europe in summer 2012 led to the creation of the Entrepreneurship 2020 Action Plan, the Commission’s central mission statement. The plan targeted three priorities for improvement: improving education, removing administrative barriers, and engendering culture. In this post, we briefly survey progress in each of these areas, before concluding with a clarion call for a new action plan. Even if it achieved nothing else, Entrepreneurship 2020 succeeded insofar as it has increased the overall salience of the issue of entrepreneurial education. The initiative does deserve praise for refreshing interest in policy circles. However, some familiar challenges remain: leaders, laggards and limited administrative attention to the topic in general. Education systems are frequently either parochial, politicised, or intractable and resistant to more radical proposals such as compulsory financial education, while teachers may lack the resources and training to deliver legislative diktats on the ground. Entrepreneurship 2020 thus placed strategic emphasis on initiatives in universities and peer learning, but schemes here appear to have had mixed results. While the Erasmus for Young Entrepreneurs programme still grows, aiming to deliver 10,000 entrepreneurial exchanges linking junior and established European entrepreneurs by 2020, the Yep! Project, a digital gateway and network formed to the same end – and explicitly quoting the 2020 plan on its homepage – has virtually no online presence. Source: Global Entrepreneurship Monitor (2017). Data unavailable for Malta. Figure 1 reflects the relative lack of self-confidence evident among Europeans who were asked about whether their own knowledge and skills were sufficient to start a business. Notably, it also demonstrates a greater confidence among younger democracies – central and eastern states that have developed their economies and education systems in tandem have proven interesting lab cases for good practice. Eurydice, the Commission body charged with comparing national education systems, has to date been circumspect on the impact of the 2020 plan. But it appears structural challenges in this area are deeply ingrained and will require renewed thought in the future. Figure 1 might also be reflective of institutional barriers to entry rather than simply educational outcomes. Could Italians be especially pessimistic not about their personal abilities per se but instead their capacity to thrive within their legal and financial system? The second pillar of Entrepreneurship 2020 focuses on this area, aiming among other things to provide access to finance, reduce regulatory burdens and take advantage of technological advancement. This is another bold agenda tackling a similarly engrained set of issues which might easily constitute an action plan in its own right. Access to finance has generally declined as a concern, moving with the business cycle: in 2018 only 7% of European SMEs identified it as their number one issue (against 13% in 2013), while 13% now cite regulatory barriers as their main problem. However, younger and low-educated entrepreneurs find funding disproportionately hard to come by, and are not explicitly helped by this part of the plan. Several of the objectives promise to iteratively ‘raise awareness’ and ‘establish best practice’ in these areas but could be sharpened to focus on deliverable outcomes. To its credit, the COSME programme continues to make substantial European Investment Bank funds available to European SMEs, though it appears unlikely to disperse its full €2.3bn endowment by 2020. Currently, a quarter of EU-surveyed SMEs cite staffing and employment issues as their single largest barrier to growth and this is conspicuous in its absence from the 2020 plan for ‘supporting new businesses in crucial phases of their lifecycle’. The final plank of the plan is culture, specifically encouraging more positive perceptions of entrepreneurs and empowering marginalised groups – women, seniors, migrants and the unemployed – to start businesses. These aims are laudable, but the 2020 plan is noticeably light on concrete actions, platforms and institutions that would help facilitate them. Women make up 52% of the European population but only 30% of start-up entrepreneurs, and rates of female self-employment have been declining in the leading countries – Greece, Portugal, Italy and Croatia – and indeed overall across the EU since 2012. The WEGate for female entrepreneurs network echoes the Yep! Project, offering useful resources but achieving limited reach to date. Initiatives for third-country migrants and seniors based on ‘good practices from Member States’ are still at nascent stages, though the Commission has allocated funding for training and mentoring for the former. Yet, more lofty ambitions to remove legal obstacles for qualified migrant entrepreneurs still seem a way off. Microfinancing schemes for unemployed citizens have, by contrast, been comparatively well-resourced, with a €1bn budget between 2014-20. Entrepreneurship 2020 remains a broad and multifaceted scheme, and it certainly cannot be criticised for lacking ambition. However, just as the EU Commission faces renewal in 2019, it appears the time might be right for a reappraisal of the EU’s goals in this area. This would likely take place in multiple steps invoking several questions. First, what are (would-be) entrepreneurs seeking today? Some challenges like education and culture are structurally ingrained, others like access to finance more cyclically volatile. A fresh, more rigorous continental consultation is required here. Second, while inter- and intra-state diversity is a constant, almost all Member States are leaders in at least one area, and so a credible and joined-up process of ‘best practice’ establishment might help establish feasible policy options. Finally, in a world characterised by deeper challenges and opportunities – increasing mechanisation, green technologies, labour market liberalisation – are the three essential tenets of the 2020 plan still relevant? Joseph Ganderson is Research Director of the Start-ups and Innovation programme at the 89 Initiative, a pan-European think tank based at the London School of Economics. He is a doctoral researcher in the Department of Social and Political Sciences at the European University Institute, Florence. His research interests include the political economy of financial regulation, taxation and corporate finance in Europe. Tommaso Giulla is a Research Officer with the 89 Initiative’s Start-ups and Innovation programme. He is a postgraduate student of Political Economy in Europe at the LSE. His research interests include monetary integration, labour markets and migration. Kayrin Gauci is a Research Officer with the 89 Initiative’s Start-ups and Innovation programme. She is a postgraduate student of Political Economy in Europe at the LSE. Her research interests include competition, trade and public economics.